Is it okay to disrespect non-Muslims and steal from them? 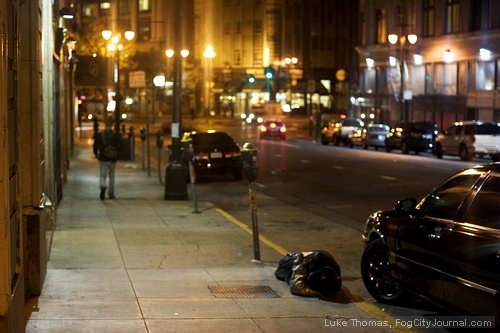 A drunk man passed out on the sidewalk in San Francisco. How should Muslims treat such people? (From Ummah1): This is a true story. Two Muslim brothers saw a non-Muslim man lying down on the sidewalk too drunk to even get up. They took his wallet and took all his money from him. Later they laughingly told this story to a friend of mine (another Muslim). They thought it was a great joke. My friend was horrified and told them that this was wrong and they had no right to do this. They stated that since he the fellow on the sidewalk was a kafir and drunk, that there was no wrong in it and that it was okay. In vain, my friend tried to convince them that this was wrong but they never saw it that way. For more Islamic advice questions and answers from our archives, click here. Dear Wael: she is three years older than me, is it wrong? Dear Wael: Is it okay to marry a policeman?